Latest post Fri, Jan 19 2018 5:39 PM by Ronald Czarnecki. 65 replies. There just so happens to be another "best" seller about to hit the bookstores! LOL!! I wonder what I'll get for royalties? I think it's available on Amazon now. I'd very much appreciate it if the undo history doesn't get deleted when switching to a different sequence. Apart from that there are many big things that Avid needs to improve, and most of those have been mentioned and discussed here already. However, I have little hope that much is going to happen in 2018 or beyond, as they seem unable to even finish the new title editor. I'd very much appreciate it if the redo history doesn't get deleted when the autosave kicks in, or when switching to a different sequence. I don't really need a tabbed timeline, since I can switch between sequences fron the dropdown menu, but the undo/redo history should stick to its own sequence and be available when loading it. Avid should invest in R&D instead of being way too profitable for the share holders, neglecting the mission to deliver cutting edge software and hardware. If You don't feed the cow You can't milk it forever. Even though this is SEVERAL years old, I recommend listening to this interview with a retired Avid Product manager. It really highlights the constraints Avid has when it comes to future development. Very enlightening, sounds like a pull between Hollywood old school editors and young editors out of college struggling on the learning curve. I just went back to look at my old alma mata college and they had AVID installed at Tri-C here in Cleveland. I was signed up for special effects class and their first project was green screen (already took this course). There was Media Composer on the computers. I asked the professor if I could edit on Media Composer he said it's just there to look at but we don't use it. Not all of the professors were able to get Media Composer qualified and so it's not an NEL that professors like to dive into. Plus will the young students struggling with simple tasks be able to succeed on a Avid editing platform. hence they stay away from using it. 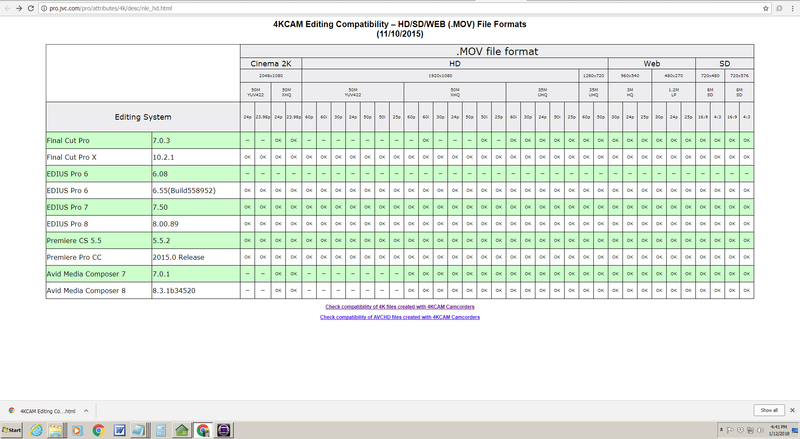 JVC has a chart that says every editing system can handle YUV 422 but Media composer. I had to convert the media ot ingest into MC but many of my young college students at Tri-C will not take that time. We have to get up to speed. Very interesting. I'm sure the constraints apply as much today as they did back then. Thanks for posting this. I think this professor isn't giving the students enough credit. Editing is no harder in Media Composer than in any other NLE. I actually started using Avid with Xpress Pro when I started out because I found it a bit easier and more logical to use than Sony Vegas which I also owned. Remember I said some of the professors failed to qualify on user certification. Everyone feels comfortable with what they know both professors and high school students so FCP is what they want on their MACs. There is also the problem with culture; graduating is more important then leaning. I graduated 2014 and occasionally go back for courses. The college wants students to graduate and it's easier to work with what they know. Sad I was a big promoter of Avid Licensing at the college but now that they have it Avid has to figure out a way to inspirer the professors to use the software. I would suggest free and on going training via internet. As to the interview with Doug Hansel, what I found most illuminating was at 23:00 - the discussion of how development must serve the storage products (my paraphrase). That is where the money is for Avid, not MC. And at 26:45 he speaks about backwards and forwards compatibility and how important it is to the company. Those of you who have used Premiere Pro CC for any length of time realize what a mostly great thing Avid has done on that front. The fact that you can open a project in Avid from a higher version in a lower, older version at all is amazing. And often useful. But that one thing - more than any other in MY opinion - is what keeps many of the old workflows and tools in MC. The insanely byzantine, frustrating effects structure is top of that list for me. And in that same point of Doug's interview he also speaks about how slow broadcasters are to upgrade. So backwards compatibility is critical. And broadcasters buy storage systems. So they are the life blood of the company. Avid has to protect that market. Look at the differences between Avid and Adobe in this area. Adobe is not selling hardware. At least directly that I am aware of. So they are not constrained by that need to make sure everything works well together. If they want to say, "Ok, next version of Premiere is only going to be on Windows 11 and Higher Sierra" they can. Not that they would, but the point is their revenue comes from the software only. These are the things I think about whenever I get frustrated by Avid. And these are the things I thing about when considering other tools. Well said. Good points about hardware and related systems. It remains a tribute to Avid that their customers can flourish on any version. So wise to encourage a yearly fee... whether it’s called a support plan or anything else. I watched the interview too. I remember what a mind blowing release Doug’s XDV was with its built-in color correction ! and its all-out freedom of interface customization. Loved that design and it was so smart because it let newbies “own” their new editing system, and accomplish something personal while they are just beginning to grasp it all. Colors and creativity. Those of you who have used Premiere Pro CC for any length of time realize what a mostly great thing Avid has done on that front. The fact that you can open a project in Avid from a higher version in a lower, older version at all is amazing. And often useful. I didn't realize Premiere Pro has so much problems with backward compatibility. Together with the hardware storage systems and stability for years to come could be a big benefit when editors get serious and work with other teamsmates on large projects. For what it's worth, I have just finished work on a project cut entirely on Avid with all titles done on Lightworks. We did the cut on Avid first, then imported the approved MP4 preview copy into Lightworks. The titles were all created in Photoshop and used several custom effects written for Lightworks to reveal and vanish. Once they received final approval the animated titles were then exported with alpha as PNG sequences, imported into Avid and laid up where needed. It sounds more roundabout than it was. In fact it was remarkably straightforward - no worse than laying up the finished sound mix.